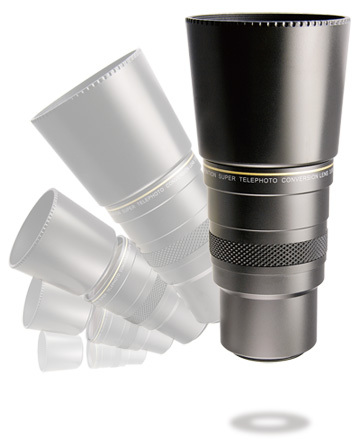 Finally, we can introduce a supreme telephoto lens of 3.0 times high-powered yet built in compact measurements of 92mm length (without Lens Shade) x 58mm outside diameter (at the largest). The new 3-group/5-element construction of high index optical glasses reached up to a high image standard of 220 lines/mm resolution power at center (MTF30%) with three times high powered telephoto magnification. It never reached before. The Lens Shade and 5-adapter rings come with the lens as a standard accessory. With the HDP-7700ES lens attached, there will be no influence on F-number of the master lens. The lens has a mounting thread of 37mm. Click lens for actual comparison images. The lens shade will cut an unwanted light beam, and it reduces flare and ghost image effect. F= Female thread size, M= Male thread size, P= screw-thread pitch. 5-adapter rings are included for 27mm/30mm/30.5mm/34mm/43mm filter sized Camcorders. Click the lens to see actual image quality comparison shots taken with our former 3.0x model DVR-3000* and newly developed HDP-7700ES HD Super telephoto conversion lens + High Definition camera. ● Vignetting may appear when used with Panasonic HDC-SD1, HDC-DX1 camera. Remove camera's front ring before you mount the lens. ● Remove camera's lens hood first when used with Panasonic HD cameras. ● The 3.0x Telephoto Lens is a precision optical instrument, assembled with critical alignment tolerance. Do not subject it to severe shock and to the conditions of excessive cold, heat or humidity. ● The built-in flash cannot be used when the Telephoto lens is attached. Otherwise, it will create a shadow of the lens on the picture. ● When the Telephoto lens is attached, the remote control system of the camera may not function properly. We recommend trying a rehearsal shooting if you have to use the remote control system, to make sure. ● To protect the camera from an accidental damage please remove the HDP-7700ES Lens before moving the camera and Do not carry around the camera with the HDP-7700ES Telephoto lens attached. ● The HDP-7700ES Lens is designed for using at the telephoto end of the camera lens, and it may create a vignetting effect (darkened corners) when zoomed to the wide angle range. ● Please note that the minimum focusing distance with the HDP-7700ES Lens attached will be approximately 9 times more of the original distance figured at the telephoto end. We recommend to use a sturdy tripod when shooting with HDP-7700ES lens on. ● You may aware of the lower magnifying power at a shooting distance of 50 meters or less, with HDP-7700ES lens attached on. It could be less than 2.8 times. ● There will be no influence on the original F-number of the camera when HDP-7700ES lens is on. It remains the original F-number of the camera lens. ● Screw-thread pitch size is 0.75mm unless mentioned.